The world is often unkind to women, using them as pawns in a masculine game of war and power and possession. But these wrongs will not be righted by inviting women to participate in the same game. They will be righted only when the voice of the feminine is allowed to be heard: in the home, in the theater, in the marketplace. Author’s Introduction: Imagine if Homer, Virgil, Dante, Chaucer, and the other great poets of ancient Greece, Rome, and the Middle Ages had been given the gift, not only to peer into the twenty-first century, but to correspond with we who live in that most confusing and rudderless of centuries. Had it been in their power to do both of those things, what might they say to us? How would they advise us to live our lives? What wisdom from their experience and from their timeless poems might they choose to pass down to us? I do not understand your age or your culture. You speak again and again of how you’ve liberated women and made them the equal of men. But your method for doing so seems to be to make your women act and think and feel like men. That is certainly not what my poor Medea wanted from Jason. Out of love for the dashing stranger from Greece, she betrayed her own father and abandoned her home in the barbaric lands of the east. She used her powers as a sorceress, first to help Jason win the Golden Fleece and take it with him to the west, and then to defeat Jason’s enemies back home and thus restore his fortunes and those of his father. Jason married Medea, and, for a while, they were the perfect couple, even begetting two lovely boys. But Jason grew tired of his barbaric wife from the Black Sea and desired a new wife who could bring him wealth, status, and prestige. He settled upon the princess of Corinth and then informed the hapless Medea of his decision. 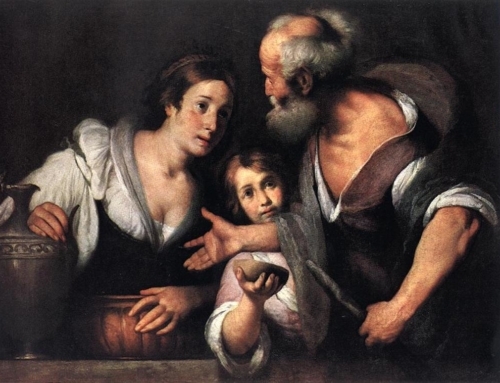 Confused and distraught, Medea went to Jason and begged him to take pity upon her and their marital vows. In response, Jason shared with her the logic behind his plan. His new marriage would secure the futures of their two boys and allow Medea herself to live in luxury. It was really the most reasonable thing to do. My poor Medea implored him to see the situation from her point of view, but all Jason would offer her in reply were cold, calculating arguments bereft of compassion or human feeling. As far as he was concerned, the emotional side of Medea’s plea was irrelevant to the issue at hand. He simply would not acknowledge its existence. In short, he expected her to handle the situation like a man. Naturally, my Medea was unwilling to do that. She was a woman, not a man, and she had no desire to efface her feminine nature to accommodate the masculine playing field that Jason tried to lay down for her. Indeed, not only did she refuse to treat the situation in rational, masculine terms; she reacted by rushing headlong toward the most emotional, feminine extreme possible. Unwilling to subject her grief and anger to logical, abstract, impersonal boundaries, she exploded with feelings and passions that could neither be contained nor controlled. Alas, once she surrendered herself to those dark, feverish emotions that ever dwell on the margins of civilization, she could not find a way back. First she used her black magic to orchestrate a ghastly death for the King of Corinth and his daughter. Then, with a rage more animal than human, she murdered her two boys. There are many among you who think the message of my play is that women should be treated exactly like men. But nothing could be further from the truth. Jason, in his cold, unfeeling blindness, thought such things: that Medea and he reasoned and felt and interacted with the world in an identical way. He was wrong, and his children paid the price for his folly. In my plays, I always spoke up for the dispossessed, for those who had no voice. Your age seems more interested in crushing the true female voice. You would save Medea, but then strip her of her unique, essential, irreducible femininity. Oh, I applaud your desire to liberate women who have been oppressed. If only some of you could have been there on that terrible day when the citadel of Priam fell and the noble Trojan women, one by one, were dragged off into slavery and concubinage. 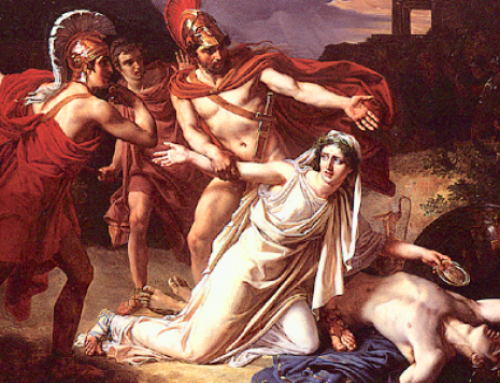 What a terrible sight that was: Andromache and Hecuba, wife and mother of Hector, treated like common harlots in the street; and the sad, tragic Cassandra, daughter of Priam, driven half mad by dark prophecies that she could not prevent. My poor, poor Pentheus, King of Thebes. He thought that he could squelch the voice and the claims of the feminine . . . and it tore him to pieces. 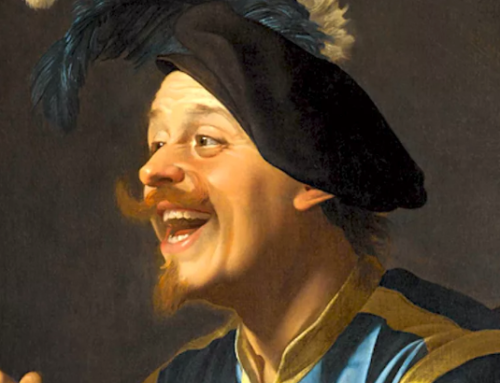 When he learned that the ecstatic, decidedly feminine worship of Bacchus was set to invade his city and its citizens, he resisted it with all the power he could muster. He watched, with horror, as women threw aside their chores and their dignity to join Bacchus’s band of female followers, the maenads, and revel on the hills. He could see only evil in the merry-making of the maenads. Even when his elderly grandfather and the blind prophet Tiresias warned him that he must find room in his city and his heart for the emotional, passionate, irrational side of life, he refused to listen or pay heed. His view of humanity, of the world, of the gods themselves was narrowly and singularly masculine. While Tiresias saw the need for balance and mutual respect, Pentheus blinded himself to the masculine and feminine poles that are inscribed so deeply and eradicably into the sexes. In the end, his denial of reality drove him mad. Possessed with a perverse lust to see the naked, inebriated maenads at their revels, Pentheus disguised himself in women’s clothing and climbed a tree. But his voyeurism did not last for long. 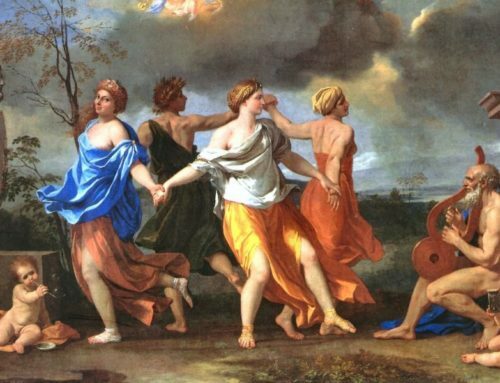 Bacchus, aware now that Pentheus would never admit the necessity or even the existence of the feminine side of life to which his mysteries appealed, cast a spell on the maenads so that they thought Pentheus was a wild animal. What happened next is almost too horrible to tell. 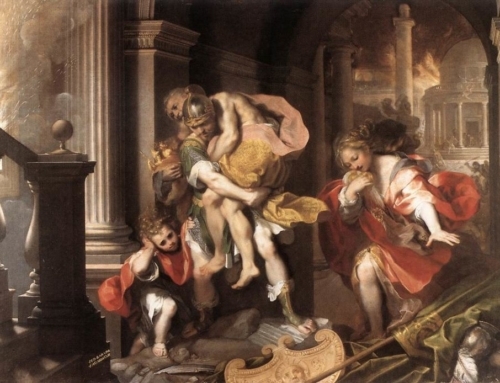 With the same unleashed fury that led Medea to kill her children, the maenads, led by Pentheus’s mother and aunts, ripped him limb from limb and put his head upon a spike. You well-meaning planners of the future, learn a lesson from Jason and Pentheus. Men and women, masculinity and femininity are not interchangeable. Both are needed; both must be affirmed. When they are not, they turn against each other, and what was once whole becomes torn in half. Editor’s Note: The featured image is “Jason and Medea” (1907) by John William Waterhouse, courtesy of Wikipedia. Louis Markos is a Senior Contributor at The Imaginative Conservative. He is Professor in English & Scholar in Residence at Houston Baptist University where he holds the Robert H. Ray Chair in Humanities. His books include Restoring Beauty: The Good, the True, and the Beautiful in the Writings of C. S. Lewis; Apologetics for the 21st Century; From Achilles to Christ; On the Shoulders of Hobbits; and Heaven and Hell: Visions of the Afterlife in the Western Poetic Tradition.